It’s been reported by some outlets this week that some players from Albion’s opponents this weekend, Spurs, are feeling tired and in need of a rest (and, aghast, not just Harry Kane). Some have been involved in Russia at the World Cup and have come back quickly to the fold for the Premier League season. Chelsea’s shining light Eden Hazard stayed at home rather than travel to Greece for the Europa League last night. I don’t know whether it is the decision of the player, manager or even the medical staff but it is an interesting discussion point. This week on Albion Unlimited, former Tottenham and Seagulls manager Alan Mullery joined us on BBC Sussex and spoke about one year when he went to a World Cup in 1970 and played 72 matches. In those days, of course, if you didn’t play you didn’t generally get paid! Many of the pundits I work with say they would prefer to play games rather than train but there are also plenty of examples of players who received special treatment during their career to accommodate their age, tiring limbs or injuries. Things have changed nowadays in some respects. Like it or not, players are a commodity, an asset to be preserved, a value that must be protected. In Mullery’s time at the Albion there was the odd international at the club and now the current squad has plenty of players who have, and will, continue to play for their countries. After the laboured start to the game at Southampton, one of the positives was the introduction of Iranian international Alireza Jahanbakhsh. He is starting to gradually increase his minutes on the pitch after his time in Russia. Colombian winger Jose Izquierdo is edging closer to the matchday squad and when he finally returns it may seem like a new signing. 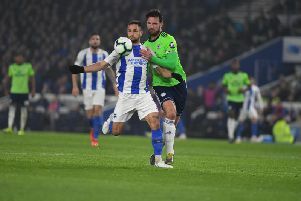 Last season the Albion were fortunate when it came to injuries but have already lost Bruno for a while and now Pascal Gross. The management of the other players is key. All clubs will be keen to ease them back in, not overload them, and prevent any injuries. I think most players would want to start every Premier League game, every Europa League match and definitely every Champions League tie but there are always other considerations. Managing the workload and emotional demands of staff is vital in all walks of life, and football is no different. However clubs are now more aware of the value of their assets than ever before.